You've heard of the Huawei Ascend D2, haven't you? In case it's your first encounter with this Chinese dragon of a phone, what we are dealing with is a potential competitor to today's high-end Android handsets. Its front is graced by a 5-inch 1080p display and inside it hums a quad-core processor of Huawei's own make. Now, although the Huawei Ascend D2 has been official for almost two months, we haven't really seen a whole lot of photos of it. Thankfully, four images exposing the handset's design have appeared on the web, and we're now sharing them for your viewing pleasure. To no surprise, the Ascend D2 has a plasticky appearance, but we'll accept it the way it is as long as its build quality is adequate. We also see a 3.5-millimeter headphone jack and a loudspeaker at the bottom, while the lock button and what looks like a SIM card tray have been placed on top. 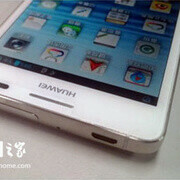 The Huawei Ascend D2 will be on display at CES 2013, so it won't be long until we get some clearer images of it. The retail price of the smartphone is expected to be around the $500 mark. It's a decent looking phone, I would like to see how it performs on the GL Benchmark and nenamark tests seeing how it's based on a quad-core processor of their own kind, seeing how Huawei is has little to no good reputation in this department, I wonder how it would fair against the snapdragon S4 pro processor chips from Qualcomm or the Exynos processors from Samsung. Personally, I'm a Samsung guy and don't like how Huawei talked crap about Samsung and their pricing. I personally feel that Samsung provides good prices for their products given the designs and how much crap they put into their phones and UI. http://www.phonearena.com/news/Calves-and-quad-cores-Snapdragon-S4-Pro-vs-Samsung-Exynos-4412-vs-Huawei-K3V2-vs-NVIDIA-Tegra-3_id35768 The K3V2 did great considering this is Huawei's frst foray into SOC's. The K3V3 will do a bit better I assume. I'm interested in seeing more from them and you shouldn't take offense to huawei's crap talking. They're just saying they offer a comparable product for cheaper(which is possible in Asia). Picking on the big boys is bound to happen. K3V3 should do a lot better considering it's supposed to be quad A15, it's supposed to be able to out-perform the quad core S4 Pro by quite a bit on paper. I didn't hear it was A15. That's awesome.